Bird Baths Will Have Them Flocking! By and large, a fresh water source will attract more birds to your yard! The best single way to entice feathered friends is with bird baths. Many species who may never visit a feeder, or even use a birdhouse to nest, will visit a birdbath with fresh water in it. Many styles will compliment an environment nicely by using design elements that are found in nature itself. 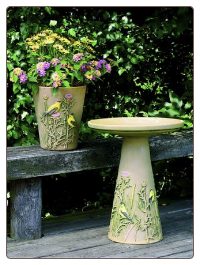 This hand made pedestal birdbath is also hand painted. Cheery Goldfinches perched on graceful branches is such a scene found in nature. These kinds of ceramic baths really do enhance the garden or yard, and bring it to life once discovered by birds. The bath doesn’t have to be a pedestal type either, hanging bird baths are also wonderful for attracting birds. 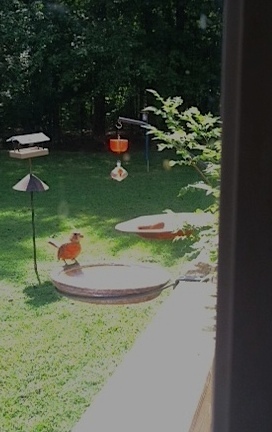 And if it’s a close-up view you’d like, deck-mount bird baths bring the action right to your window. 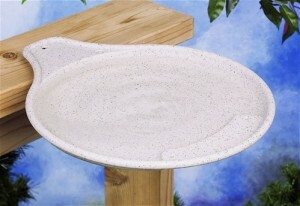 Hanging and deck mounted bird baths are also perfect for smaller spaces. While birds tend to bathe at ground level in the wild, raised baths are preferred if predators lurk in the yard. The optimal water depth for bird baths is really only two to three inches. This is the depth where birds can bathe and wade comfortably. If the birdbath is deeper, a large rock may be placed in the center for birds to perch. Adding a birdbath to your yard will positively impact the numbers and different species who will visit…try it and see! 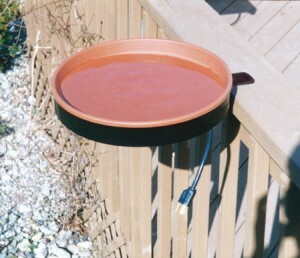 Compact Heated Bird Baths—Bang for Your Buck! Even though some of us may only have limited space for backyard birding activities, there are a few innovative items sure to maximize that small space. 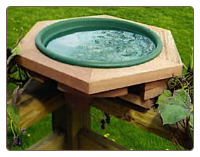 Bird baths for example, are a great way to attract more species of wild birds, some who may not even frequent birdhouses or feeders. If you live in an area that sees freezing winter temperatures…heated bird baths make the most sense. 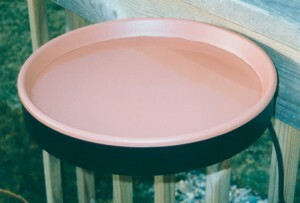 Deck mount bird baths are perfect for the tiniest decks and even apartments with balconies. During frigid winter months, many folks will stop using birdbaths. But what about the birds? Think about it, they still need water to drink and bathe so feathers work properly. When most baths are rendered useless by freezing temps, birds must work harder and fly farther in search of fresh water. This is why heated baths make more sense, they’re available for birds to use year-round, and with a single purchase, you’ll have a summer time, and critical winter fresh water source for feathered friends! We don’t usually think of it, but buying “off season” is known to save money. With some of the larger companies, many winter biding items go on sale during summer to make room for new products. If you’re a backyard birding enthusiast, this is a perfect time to invest in higher end wild bird accessories. Even though it’s summer, heated bird baths can still be used and enjoyed by many birds and their hosts…sans electricity. Just tuck the cord away and you now have a birdbath for year-round use. 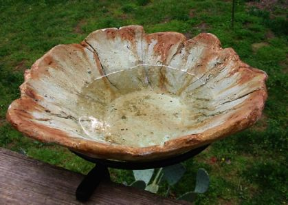 With spring fever upon us, many folks who enjoy wild birds might be thinking of new bird bath for the season. There are so many beautiful styles from which to choose, it can get confusing. Consider first if a hanging, pedestal, or deck-mount model is what you’re after as far as yard decor. Then don’t forget about cleaning and maintaining the birdbath, choose something that is easy to clean, fresh water is a must for wild birds in summer time. The most important factor is depth. Many birdbaths are really too deep for wild birds to drink and bathe comfortably. No more than two inches of water is necessary. If your existing birdbath is too deep, consider placing a large rock in the center for birds to perch. Also, the Birdbath Raft will turn any container of water into a functional bird bath. The newer birdbaths feature an uneven, or graduated bottom, the same concept as an inground swimming pool, where you walk in. This is a great idea and very accommodating for songbirds too.